New York City, NY – Earlier this week, WikiLeaks’ Julian Assange tweeted out a graphic by Swiss Propaganda Research (SPR), a research and information project on geopolitical propaganda in Swiss media, which reportedly illustrates heavy influence exercised by the Council on Foreign relations over the U.S. mainstream media narrative delivered to the American public. The council member referenced is Robert Kagan, co-founder of the Project for a New Amercan Century (PNAC), and husband of another CFR member, Victoria Nuland, the former Assistant Secretary of State for European and Eurasian Affairs at the United States Department of State during President Obama’s second term. In open letters to Clinton and GOP congressional leaders the next year, the group called for “the removal of Saddam Hussein’s regime from power” and a shift toward a more assertive U.S. policy in the Middle East, including the use of force if necessary to unseat Saddam. The next morning — before it was even clear who was behind the attacks — Rumsfeld insisted at a Cabinet meeting that Saddam’s Iraq should be “a principal target of the first round of terrorism,” according to Bob Woodward’s book Bush At War. Nuland was the lead point person overseeing the State Department’s activities during the coup that ousted Ukrainian president Viktor Yanukovych. In fact, a leaked phone call allegedly between Nuland and US Ambassador to Ukraine Geoffrey Pyatt indicated the U.S. selecting acceptable Ukrainians to sit in positions of power in a future Ukrainian government. 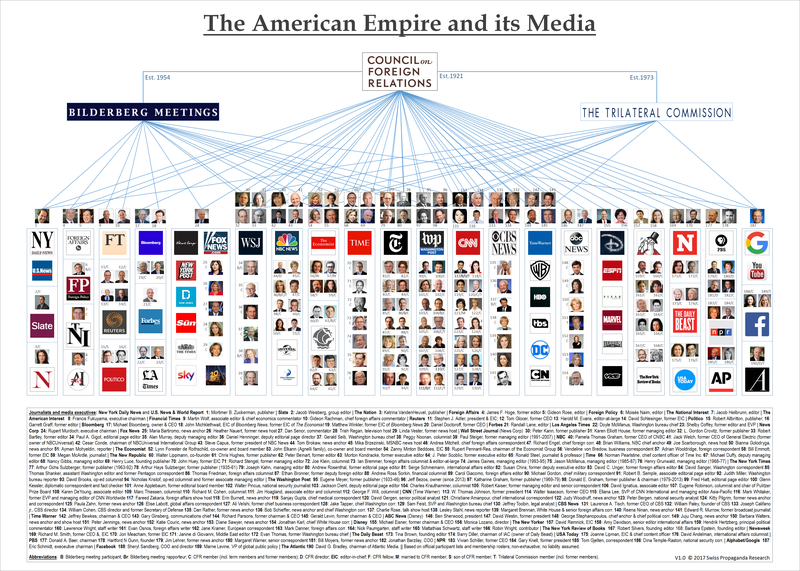 The following illustration is based on official membership rosters compiled by SPR, and alleges the interrelation of CFR’s extensive media network and its main international affiliate groups — the Bilderberg Group (covering mainly the U.S. and Europe) and the Trilateral Commission (covering North America, Europe and East Asia).